For early stage caving projects, there is usually a high degree of uncertainty in the input parameters that impact the mine design and strategy. When dealing with such uncertainty, it is better to quickly generate multiple designs and schedules that cover the likely range of key parameters rather than evaluating only a few or even a single case based on precise but inaccurate parameter assumptions. SRK has worked on many early stage projects and has developed processes and tools for rapidly generating an array of conceptual cave designs and schedules for use in our rapid economic evaluation and strategic planning process. 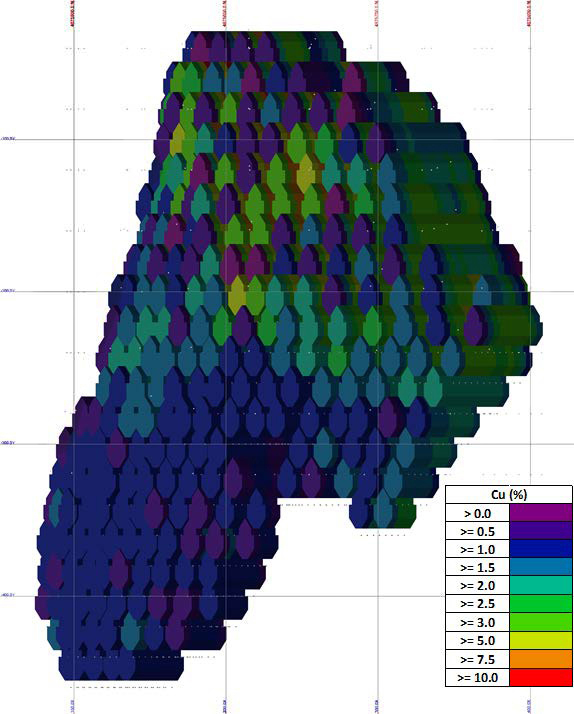 For block caving projects, the rapid generation of designs and schedules is done using GEOVIA’s Footprint Finder> It is part of the PCBC caving simulation package, and complements a suite of proprietary software tools and templates used to automate and manage the process and collate the data. For sublevel cave projects, we use a similar mix of proprietary software and processes along with GEOVIA’s PCSLC application. Using these tools, we can generate a suite of designs and schedules, each built to a specific scenario defined by a unique combination of parameter values. Key parameters that most influence the cave design in terms of footprint boundary and elevation are the assumed commodity prices, metallurgical recoveries, discount rate and to a lesser extent operating costs. It is found that mixing and footprint development costs have little impact on the placement of the footprint or the overall mine strategy. Design details such as drawpoint layout, undercutting and infrastructure are not critical for this process and costs can be estimated based on area, perimeter, and depth of each footprint. Each design or schedule can then be fed into our rapid economic evaluation model to see how it responds over a range of conditions. Designs can be evaluated using different assumptions on costs, prices, material handling systems, productions rates, and more. Instead of generating a single mine plan for an assumed set of conditions, this process enables the identification of robust strategies that perform well across a range of conditions. SRK’s strategic planning process has been used multiple times to assist our clients not only in assessing the economic viability of a caving project, but to select strategies for further study that balance risks with potential reward. The ability to rapidly generate designs and production schedules is a key component of this process.